I hope you have read the previous posts on Tatta Adavu which describes the First and Second steps for this adavu. We can again refer to the animation for the third step for a better understanding. 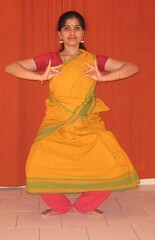 Stay in the Ardhamandal (Half seated posture). Place your Palms on the waist with the inside of the palm facing outside. After the third tap of the right leg, lift your left leg in a similar fashion and then tap the floor with flat feet (say “tai ya”). Once the Left leg is grounded, again lift the same (left) leg and tap the floor with flat feet (say “tai hi”). Again lift the same (left) leg and tap the floor with flat feet (say “tai tai tam”). Combine the third step into your practice routine. I shall post the details of next 3 steps soon. Watch the Video for Tatta Adavu here.